Affinity purified against phospho specific peptide. 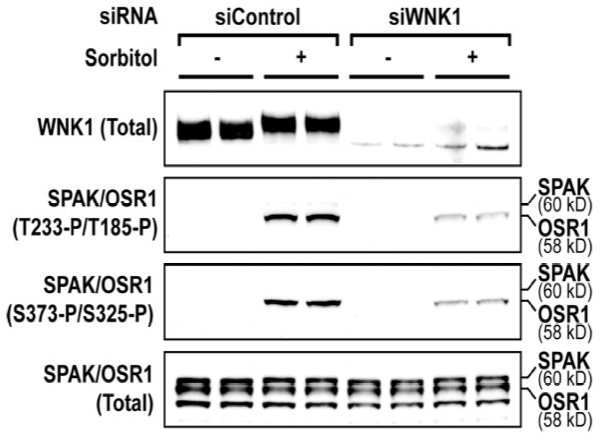 HeLa cells were transfected with a control siRNA duplex or a siRNA duplex targeting human WNK1. 48 hours after transfection, cells were either left untreated or stimulated with 0.5 M sorbital for 30 mins. Total cell extracts (20 ug) were immunoblotted with the following antibodies: Anti-WNK1 (61 - 661) [S119B] Anti-SPAK phospho Thr 233 / OSR1 phospho Thr 185 [S688B] Anti-SPAK phospho Ser 373 / OSR1 phospho Ser 325 [S670B] Anti-SPAK / OSR1 [S637B + S636B] Binding of the primary antibody was detected using rabbit peroxidase conjugated anti- sheep IgG antibody (1 in 10, 000 dilution, Pierce) followed by enhanced chemiluminescence (ECL, Amersham). Regulation of activity and localization of the WNK1 protein kinase by hyperosmotic stress.